Still, Turner warned partners about the Google Apps threat. To rally partners, Microsoft earlier this week unveiled Office 365 Open, which allows partners to manage end-customer billing for cloud services. Office 365 Open is a big step for Microsoft, which has controlled customer billing since the cloud platform launched back in June 2011. Still, Turner is exaggerating Microsoft’s success when he says Google Apps doesn’t win much. Many of the top 100 cloud services providers are Google Apps partners, and some of those partners are growing more than 100 percent annually, according to Talkin’ Cloud’s research. 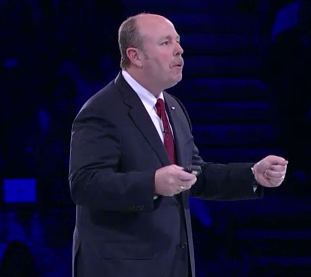 Back at the WPC keynote, Turner also described how Microsoft and partners can defeat VMware, Oracle and IBM in the channel. Talkin’ Cloud’s sister site, The VAR Guy, has a complete recap.